It’s all part of their pledge to eliminate avoidable single-use plastic on their aircrafts and offices by the end of 2019. Speaking at the time of their pledge in March last year, Hi Fly President, Paulo Mirpuri, said: “Up until now, human beings have believed the ocean is an inexhaustible source of food and pleasure as well as a limitless garbage dump. The reality, however, is that the ocean has its limits, and these are very close to being reached. We can no longer ignore the impact plastic contamination has on ecosystems, as well as on human health”. For their trial run, Hi Fly completed 4 flights that were totally single-use plastic free, along with another 12 flights that used a significantly reduced amount of plastic. Plant-based catering disposables by Vegware, made from renewable, lower carbon and recyclable materials. PLA & CPLA — compostable bioplastics made from plant starches. PLA (polylactic acid) is made from sugar (usually that of corn starch, sugar cane, sugar beet or cassava). CPLA stands for crystallised PLA, and is used for catering products needing to withstand a higher heat, e.g. cutlery, or lids for coffee or soup. After the flights, food waste and packaging were collected and given to a licensed waste management operator, where they could be processed to create energy. 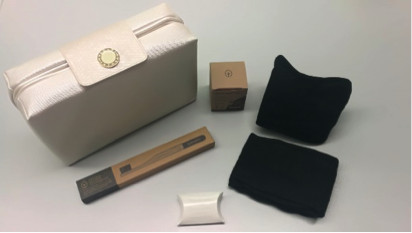 Glass bottles were returned to their supplier to be cleaned and refilled, bamboo cutlery was sanitised to be used again, and paper & card were grouped for recycling. 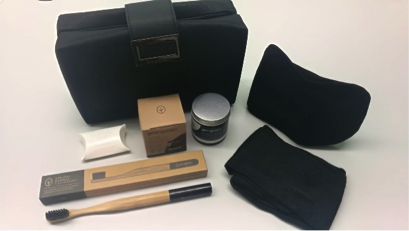 The amenities kits were also kept plastic-free, with items such as a bamboo toothbrush and tooth paste in powder form. All up, the trial flights saved 1.5 tonnes of plastic waste. If this much was only for 16 flights, imagine the impacts if this could be implemented by more of the 100,000 flights around the world that take off each day. Up until now, human beings have believed the ocean is an inexhaustible source of food and pleasure as well as a limitless garbage dump. You can follow along with Hi Fly’s journey into more sustainable travel on their Instagram.